Harry Clarke (Irish, 1889–1931) was known both as a prolific stained glass artist and a book illustrator. His illustrations for Hans Christian Andersen’s Fairy Tales, published to critical acclaim in 1916, brought Andersen’s characters to life through a delicate blend of line, pattern, and color. In particular, the jewel-like colors, so reminiscent of Clarke’s work in stained glass, enriched the much-loved author’s fairy-tale world. 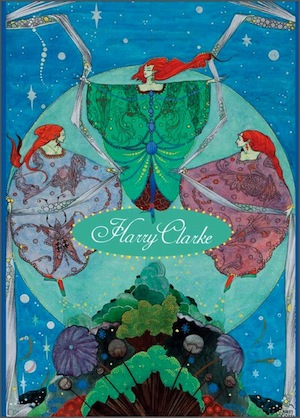 Clarke completed the Fairy Tales illustrations around the same time that he commenced work on his first major stained glass commission for the Honan Chapel in University College, Cork. Clarke’s reputation was established with these two accomplishments, and from that point on, commissions poured his way. Plagued by ill-health for the majority of his working life, Clarke died from tuberculosis at age forty-one. Despite his short life, Clarke’s level of industriousness and expertise was remarkable. His exceptional graphic work and unparalleled stained glass designs continue to delight audiences to this day. Featured in this notecard set are Clarke’s illustrations for four magical tales: The Elf-Hill, The Garden of Paradise, The Nightingale, and The Snow Queen.